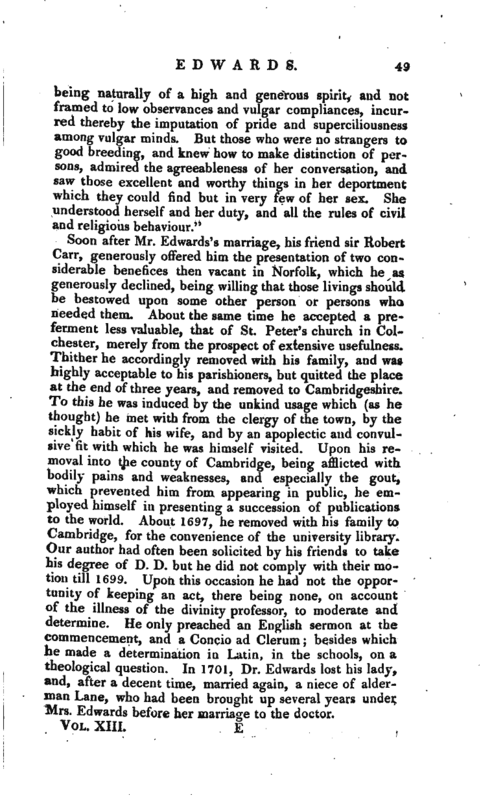 Soon after Mr. Edwards’s marriage, his friend sir Robert Carr, generously offered him the presentation of two considerable benefices then vacant in Norfolk, which he as generously declined, being willing that those livings should be bestowed upon some other person or persons who needed them. About the same time he accepted a preferment less valuable, that of St. Peter’s church in Colchester, merely from the prospect of extensive usefulness. Thither he accordingly removed with his family, and was highly acceptable to his parishioners, but quitted the place at the end of three years, and removed to Cambridgeshire. To this he was induced by the unkind usage which (as he thought) he met with from the clergy of the town, by the sickly habit of his wife, and by an apoplectic and convulsive fit with which he was himself visited. 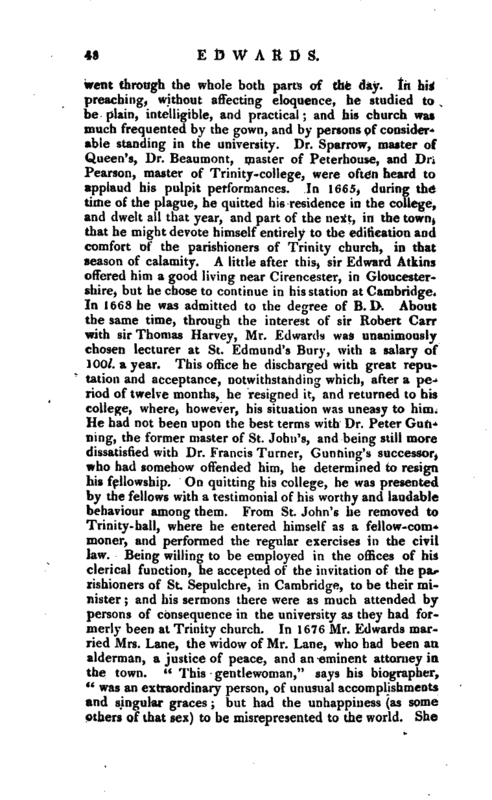 Upon his removal into the county of Cambridge, being afflicted with bodily pains and weaknesses, and especially the gout, which prevented him from appearing in public, he employed himself in presenting a succession of publications to the world. About 1697, he removed with his family to Cambridge, for the convenience of the university library. Our author had often been solicited by his friends to take his degree of D. D. but he did not comply with their motion till 1699. Upon this occasion he had not the opportunity of keeping an act, there being none, on account of the illness of the divinity professor, to moderate and determine. 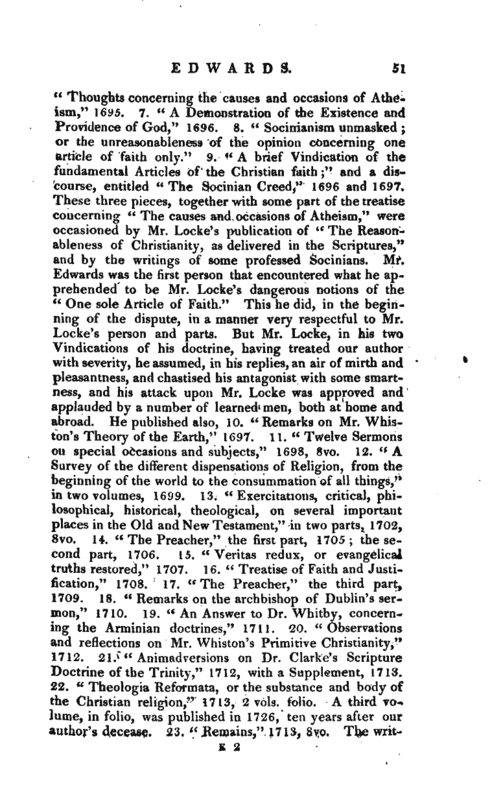 He only preached an English sermon at the commencement, and a Concio ad Clerum; besides which he made a determination in Latin, in the schools, on a theological question. 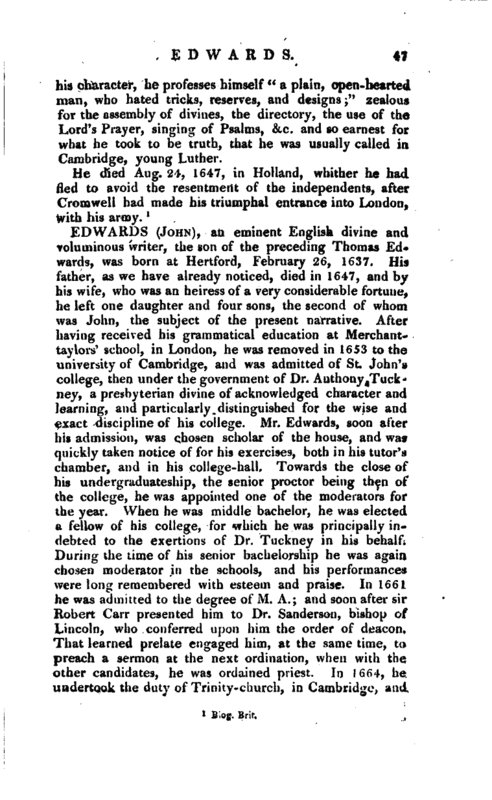 In 1701, Dr. Edwards lost his lady, and, after a decent time, married again, a niece of alderman Lane, who had been brought up several years under Mrs. Edwards before her marriage to the doctor. | It is remarkable, that, notwithstanding his numerous; publications, he was never possessed of a library; some bibles, lexicons, dictionaries, and other works of a similar nature and constant use, excepted. The university and college libraries furnished him with all the classic authors, and Greek and Latin fathers, and indeed with whatever related to ancient learning. These he either perused in the places where they were kept, or had them brought to his chamber; and his method was, from the early part of his life, to make adversaria and collections out of the books which he read, and all along to frame notes, observations, inferences, and reflections, from and on them, and to reduce them to the particular heads and subjects on which he designed to treat. He never had a commonplace book. With regard to modern authors, his practice was to procure the loan of them from the booksellers, at the price of sixpence for an 8vo, a shilling for a 4to, and two shillings for a folio. By this good husbandry, he was forced to read the works which he borrowed within the time prefixed; whereas, otherwise he might perhaps never have perused them thoroughly. 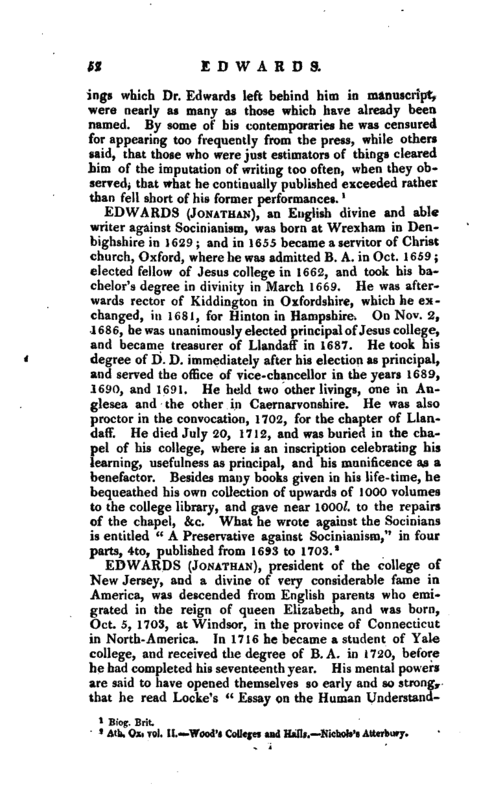 Dr. Edwards continued in his course of diligent study and repeated publications till near the period of his decease, April 16, 1716, in the seventy-ninth year of his age. Catharine, his second wife, who is said to have been adorned with every Christian grace and virtue, survived her husband nearly thirty-nine years. She died on the 14th of January, 1744-5, aged eighty-one. 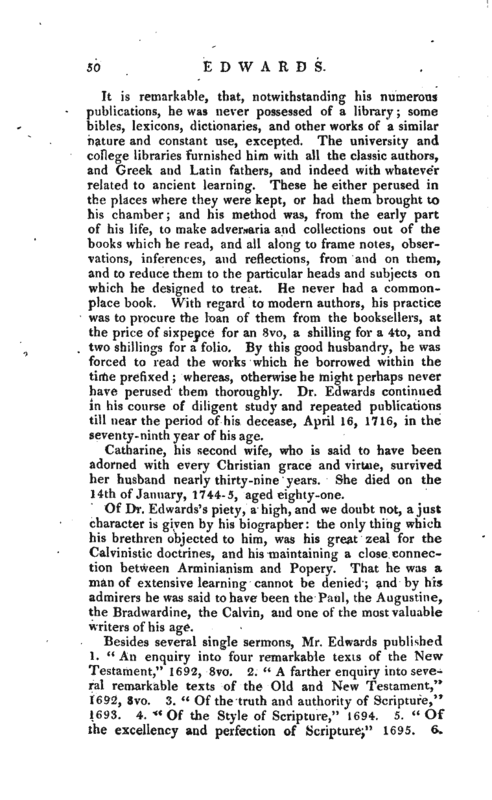 Of Dr. Edwards’s piety, a high, and we doubt not, a just character is given by his biographer: the only thing which his brethren objected to him, was his great zeal for the Calvinistic doctrines, and his maintaining a close connection between Arminianism and Popery. That he was a man of extensive learning cannot be denied; and by his admirers he was said to have been the Paul, the Augustine, the Brad ward ine, the Calvin, and one of the most valuable writers of his age.